One of the fun things you can do with uranium is to turn big atoms into little atoms. All natural heavy nuclei will undergo fission after a hard enough kick (for instance, protons accelerated to around 50 MeV will fission gold or bismuth), but to split uranium, all you need are some household-variety neutrons. Offering a neutron to a U-235 or U-238 nucleus is like giving Mr. Creosote his “wafer-thin mint” in the infamous Monty Python sketch: the recipient is violently blown to chunks and the surroundings drenched in postprandial gibbage! Maybe I’ve gone overboard with that metaphor. Anyhow, uranium fission residues include a long list of mostly-radioactive lighter nuclei, additional prompt and delayed neutrons, and some gamma rays. 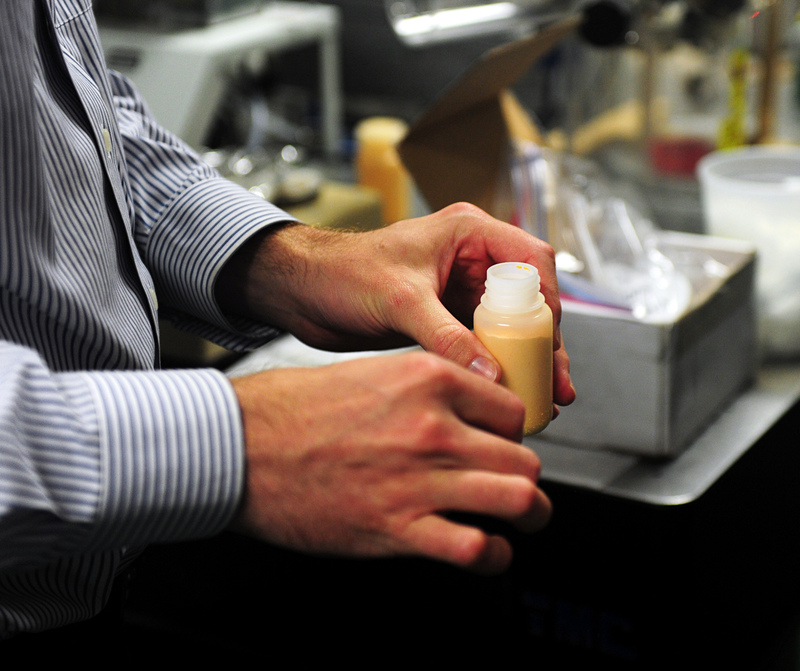 25 grams of uranyl peroxide in a Nalgene bottle, ready to be irradiated with neutrons. The 2-4 Ci PuBe source used to irradiate the uranium sample. A string is provided for safe handling. The experiment described here relates to the question of what specific fission product gamma signatures a nuclear hobbyist, equipped with typically limited resources, is likely to observe pursuant to neutron irradiation of some natural uranium. Preliminary considerations suggest we’ll only notice products that emit strong gamma radiation, have a half-life comparable to or shorter than the irradiation period, and have high fission yields. 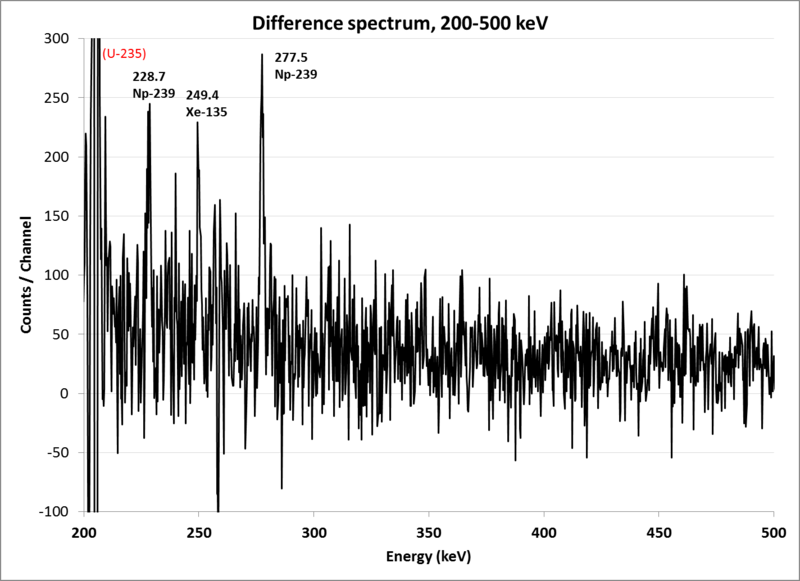 Uranium’s natural radioactivity causes additional complication, probably blinding us to fission products that emit at energies near the major features of the Pa-234 spectrum. Beyond these generalities, predicting what we might see is a nontrivial task, so the question can really only be addressed convincingly by experiment. Neutron source and uranium are lowered into a wax moderator. _ at the University of _ kindly offered his HPGe detector for use in this experiment. I irradiated 25 grams of natural uranyl peroxide, freshly prepared from Utah pitchblende ore, overnight with a ~5E+06 n/s PuBe neutron source. This source intensity is comparable to contemporary hobby fusion neutron sources, like well-constructed Farnsworth fusors. After irradiation, a 2.5-hour gamma spectrum of the sample was collected with an HPGe detector. 25g of non-irradiated uranyl peroxide in an identical container served as a control, the spectrum of the control being subtracted from the spectrum of the irradiated sample to eliminate most features belonging to uranium or its own decay daughters. What we’re left with is a difference spectrum containing features attributable to the nuclear transmutations in the irradiated sample. 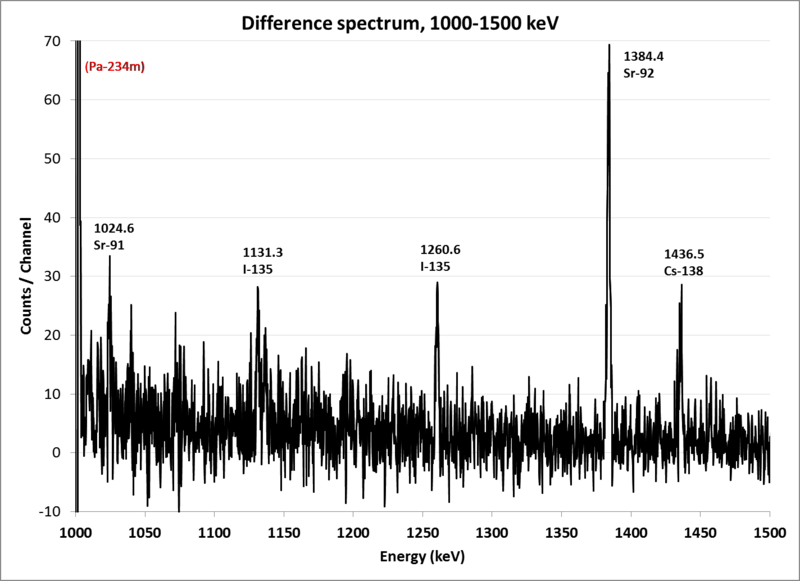 Here’s that gamma spectrum, in three graphs, encompassing the range of 200-1500 keV. I have labelled the identified peaks. So what did we make? Here’s a summary of the nuclides contributing peaks found in the gamma spectrum, with my comments on a few. All are short-lived, having half-lives between 30 minutes and 2.4 days. 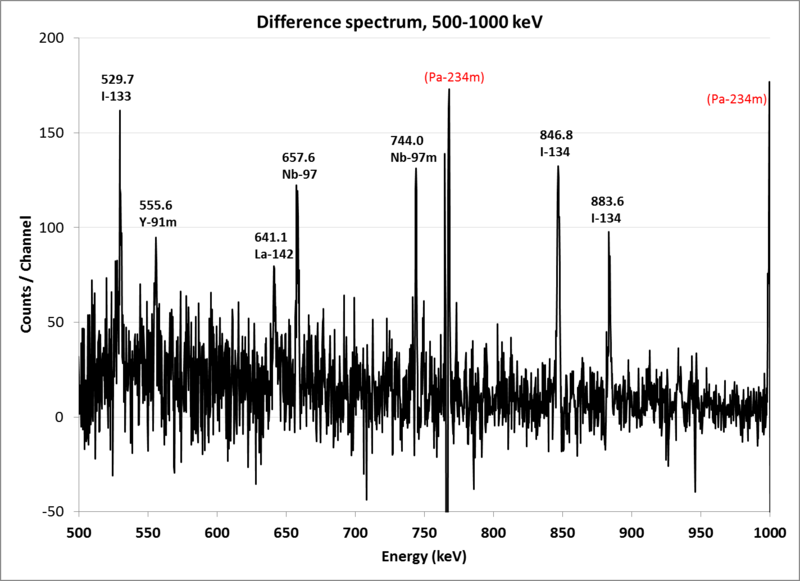 Np-239: The largest new peaks in the above spectra are the ones at 229 and 278 keV belonging to Np-239, which is formed not by fission but by (n,g) neutron capture on U-238 followed by beta decay of U-239. Np-239 is the parent of the important fissile isotope, Pu-239. Sr-92: Although not the largest new activity, Sr-92’s peak at 1384 keV is the most prominent above background. I-135 and Xe-135: These are high-yield fission products, Xe-135 being the daughter of I-135, having huge neutron cross-sections, responsible for effects known variously as “xenon poisoning” and the “iodine well” in nuclear reactor behavior. Sr-91 and Y-91m: Sr-91 is a high-yield fission product; Y-91m is not, but grows in as Sr-91 decays. If you’re doing a fission experiment with a very weak source of neutrons, and your irradiation time is on the order of at least a few hours, I recommend you first set your sights on Sr-92’s whopping peak out at 1384 keV. If you can’t see that one, you probably won’t see anything else. Xe-135 and the iodine isotopes might be easy to separate from an aqueous uranium solution by solvent extraction with corn oil or some similar nonpolar medium, improving their visibility against background. More writeup on this experiment here. Many thanks to _ at the University of _ for the use of some of his resources.